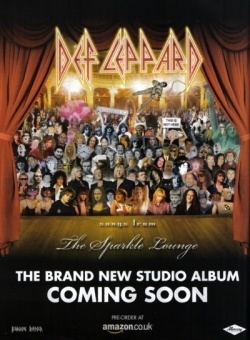 Def Leppard released their ninth studio album Songs From The Sparkle Lounge on this day in 2008 in the USA and Canada. The ninth studio album of all original material was released on 29th April in North America. It had been released digitally in the UK on 27th April ahead of it's full release there on 5th May. The album entered the US chart at Number 5 and Number 7 in Canada in May 2008. The recording process began on the 2006 YEAH! tour in the USA. 'The Sparkle Lounge' was the name given to the room where the band recorded new ideas in the backstage area of various venues. 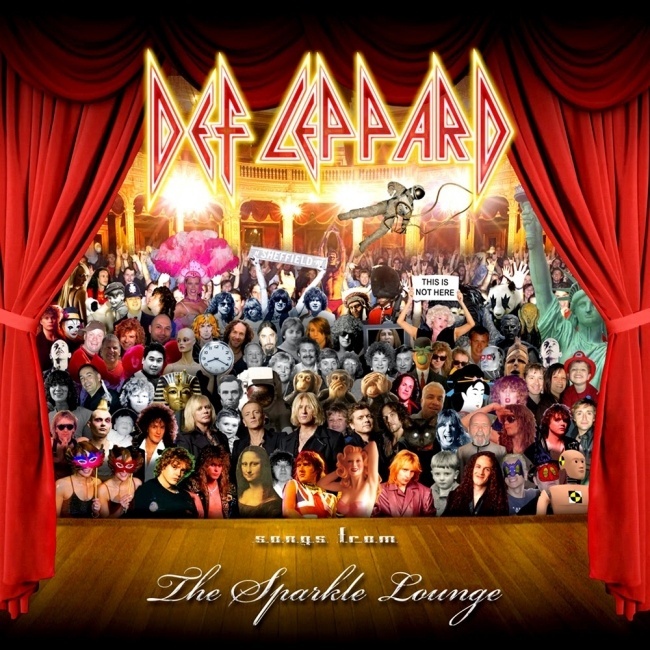 In March 2007 Phil Collen revealed they were using 'Sparkle Lounge' as the album's working title. This room would be decorated with lights and carpets and was jokingly named by the crew members. Much of the album's recording was done during this tour with the band then working at Joe's Garage studio in Dublin for the first few months of 2007. It would be another year before the album would be released as the band took a break to tour North American again in 2007. In contrast to the latest album most of the songs were written individually. The epic ballad 'Love' had been worked on by Sav for almost 15 years according to Vivian. The more stripped back and rocking sound of the album was heavily influenced by the recording sessions for the 'YEAH!' 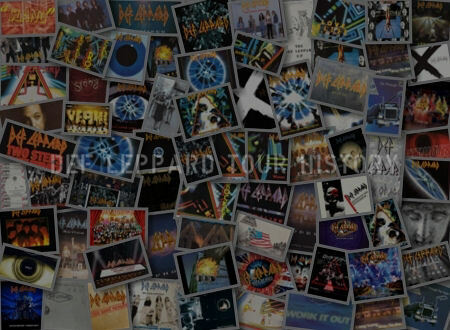 covers album of 2006. The 2007 Dublin sessions were also filmed for use on the accompanying 'Sparkle Lounge' DVD. A first for the band. It was finally released in April/May 2008. Six years after the 'X/Ten' album and was once again produced by the band with Ronan McHugh. The cover art, which was heavily inspired by The Beatles 'Sgt. 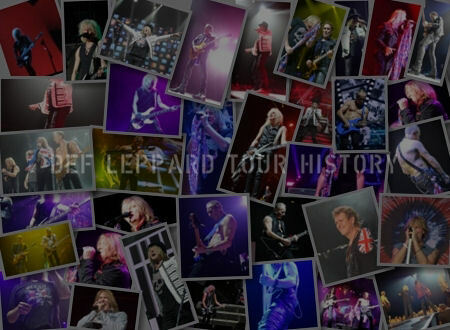 Peppers', featured various photos of the band along with family members, friends, employees, record company staff, management as well as some historical references. The first single Nine Lives had been released digitally on 24th April. A second single 'C'mon C'mon' would follow in July in the UK. Below are some quotes about the album from the band. "There was a thought process behind it that we wanted to deliver a specific kind of record, but that specific kind of record was, if you like, a non-specific kind of record." "With this one it was a case of, "Let's just hone in on the songwriting and we'll use 2008 production techniques, if you like, to make it sound more like a '70s record." It sounds very complicated, but it actually wasn't." "I think a lot of it [i]is[/i] overspill from the "Yeah" album. When we went in to do the covers record we didn't have to worry at all about one word or one note from a writing point of view; all we did was ... record these songs that made us all, [at] the age of 10 or 11 or 12, plead for our first guitar." "So then when it came to this one it was a case of, "Alright, let's try to sit down and write some songs that, if we were out buying records, they would be the kinds of songs we [would] want to buy." So we all just sat down and wrote what we thought were meaningful songs." "What we did with [the Sparkle Lounge] was we took a lot of songs that were already half-written and it was a lot easier. We'd go in and really work on these songs, and by the time we started recording them we knew them really well and there was not that much of a learning process because.... So it was probably the best recording situation for new music we've ever had." "I can't mention any songs yet but the working title is Sparkle Lounge." "In a sense, it was a lot easier because we didn't have to finish the tour and then start thinking about what direction we wanted a new record to go in," Collen said. "It was already done, and that's what was so cool about it." "By our standards, it's a very different album, as we've been very adventurous musically on certain numbers," Elliott said in a statement. "There will definitely be some moments on it where anybody that's familiar with our music will go, ‘Whoa! I wasn't expecting that!'" (On Tim McGraw) "He's such a pleasure to work with, someone who's both inspiring and creative," Collen said of McGraw. "He's just an infectious guy to be around." "People keep saying it's way better or more aggressive than X but I'm not sure it's that massive a progression. 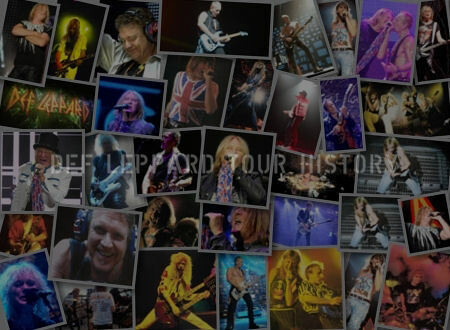 Sure there are elements of classic Leppard but we've kept it simple too. We've brought out the elements we like, but haven't gone for the huge production that we would have used back in Hysteria days. We didn't consciously try to get back to our roots; what you hear is just how the songs came out." What exactly is the Sparkle Lounge? "It's the name our crew gave to the trailer we practice in when we were out on tour - and seeing as we worked up most of these songs while on the road, it seemed an appropriate title. We'd have little amps set up and these tiny decorative lights all over the place to give it some vibe. I think it was something Jane's Addiction used to do. The way we wrote this album was a lot more spontaneous than normal." Last year's covers album YEAH! was a lot of fun - did that set the tone for this one? "Some people said we'd made YEAH! as a treat for the fans - but really it was a treat for us. It was so much fun to get in a studio and record some of our favourite songs in a Def Leppard style, and not always the obvious choices. We were on a roll after that, and all we've done is kept that playful, fun vibe alive for this new album." "We have about eight songs on the go but we have two that are demoed. We are trying the new songs out backstage. We have this thing we call The Sparkle Lounge, which is three little tiny Fender amps and a little bass amp. Rick Allen has this tiny little Roland drum kit. You can fit this stuff in the back of a trailer. We are doing some pre-production and we think we will have at least five or six songs totally produced and ready to go by the time we come off the road. We are going to start recording in January." "It is very rock. 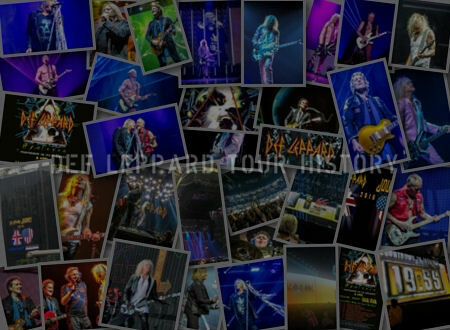 In fact, it is more rock that it has been in a few years. What we have tried to do in the recent past is to make great songs and in doing that we kind of left the edge off and let things get rounded off a little bit. We want the next album to have a rough edge. I think the new album will be a lot more raw." 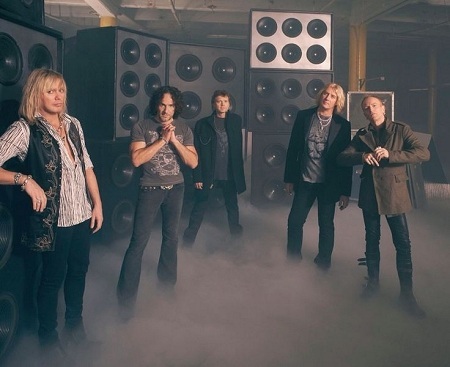 "The whole record's got a great '70s feel," said lead singer Joe Elliott. "By our standards, it's a very different album as we've been very adventurous, musically, on certain numbers. On the album there are classic Def Leppard songs and then there's also tracks that are very new-wave influenced while others sound like middle-to-late '70s AC/DC. There will definitely be some moments on it where anybody that's familiar with our music will go, 'Whoa! I wasn't expecting that!'"